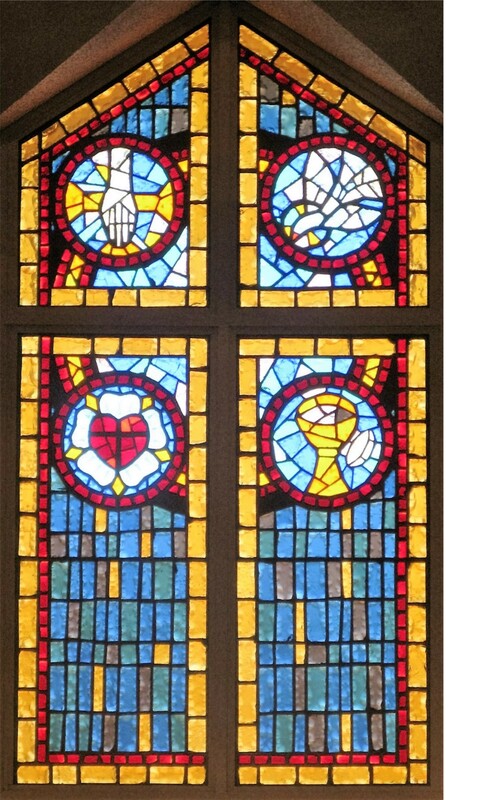 The story of our evangelical heritage and confession of the triune God is revealed in the rich symbolism of our stained glass window. The window, installed in 1983, is made up of approximately 58 square feet of hand-fabricated, faceted glass set in epoxy. The downward pointing hand represents God the Father, and refers to His activity in the creation of the universe and all that it contains. The Father's benevolent hand is reaching out to man. He sent His Son to redeem us and gives, or sends, the Holy Spirit. Around the hand is a tri-radiant nimbus, which indicates the first person of the Trinity. The descending dove represents the Holy Spirit as He appeared during the baptism of Christ, descending from the clouds in the form of a dove. Around the head of the dove is another tri-radiant nimbus, this time indicating the third person of the Trinity. The Holy Spirit converts us, preserves our faith, and sanctifies us through the Word of the Gospel and the Sacraments. The coat of arms (or seal) of Luther: A black cross is placed in a red heart to remind us that faith in the crucified Jesus saves us. This heart is in the midst of a white rose, a symbol of that faith, which gives joy, comfort and peace. The heart and rose are placed in a sky-blue field to denote that such joy of faith is a beginning of the future heavenly joy. And finally, the ring around this field symbolizes the eternity of heaven - the blessedness that lasts forever and has no end, and is precious beyond all material joy and blessing. The unleavened bread and the chalice, containing wine, represent the Sacrament of the Altar, or the Lord's Supper. The earthly elements in this means of grace are bread and wine, the heavenly elements are the true body and blood of our Lord Jesus Christ. We believe both are received in an incomprehensible, supernatural manner by those coming to the table. The small circles are symbols of the eternity of God, having no beginning and no end. They also symbolize perfection, completeness, continuity, and the eternal life of a Christian. The large circle links the symbols and the cross, and sets forth the unity of God and His Church.